Squash is back, and oh my there is a lot of it. Copley Square Farmers Market had squash everywhere this week. New England never has a lack squash in the fall and winter, even come spring there are still local squash leftover. Kabocha is similar to what most of us know as a pumpkin. It's a Japanese variety that's just a bit sweeter and starchier. As I mentioned in my instagram post, an excellent arm workout is the best way to describe how a kabocha squash is prepared. 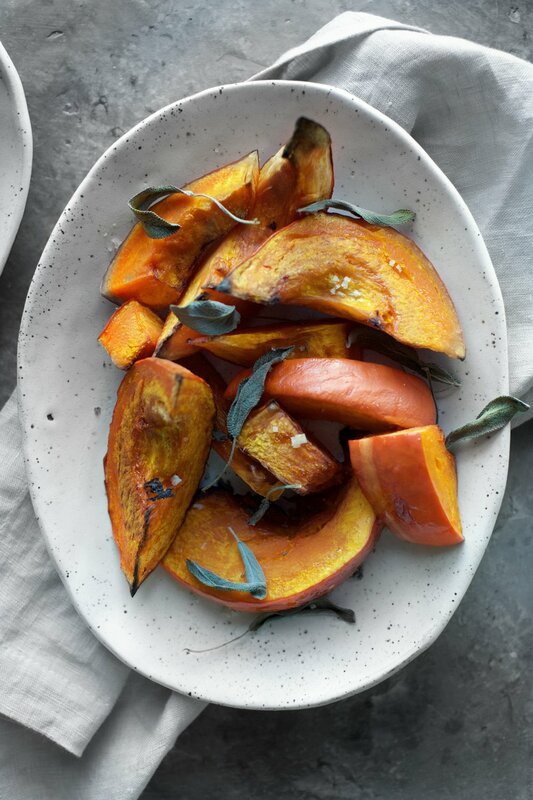 Kabocha squash can be used in sweet and savory applications, and doesn't necessarily need to be heated to eat. Plus, a singular squash makes an abundance once cut. Having this ready to roll for my week makes more time for things like taking walks and acting on responsibilities. The theme of this week was to confront the entities in my life that I let be without really addressing through most of September. Math equations, textbook readings, interpersonal connections, applications, yoga practice. It's not as if any of these entities fell apart, they just weren't actively being tended to. So at the beginning of this week they all asked for my attention in some form. When the load is heavy, handling things one at a time seems to be my most effective approach. I used to try to address every pressing issue in my life at once, thinking that was a more validating approach. Nope. Using what I've got right there and then and taking responsibility for my choices gets me to an easier place of choosing an action. Much of the time I get to this space by making time to take a good walk. It's my ideal headspace to mull over what needs to be addressed by an action or just to compartmentalize everything I absorbed during the day. Destination need not be known, I suggest it to everyone who asks for how to deal with stress like a prescription these days. Anywho, back to squash. 1 kabocha squash organic when possible, if not be sure to cut off the skin! Wash the kabocha squash well. To do this, I let it soak in a bath of warm water and grapefruit seed extract and then scrub to remove any tough bits of dirt. Prepheat the oven to 425°F and prepare a baking sheet. Cut the kabocha squash into chunks or slices at least 1" thick. Remove seeds as you go. Brush each chunk with ghee, and sprinkle with celtic sea salt. Roast for 30 minutes before adding fresh sage. 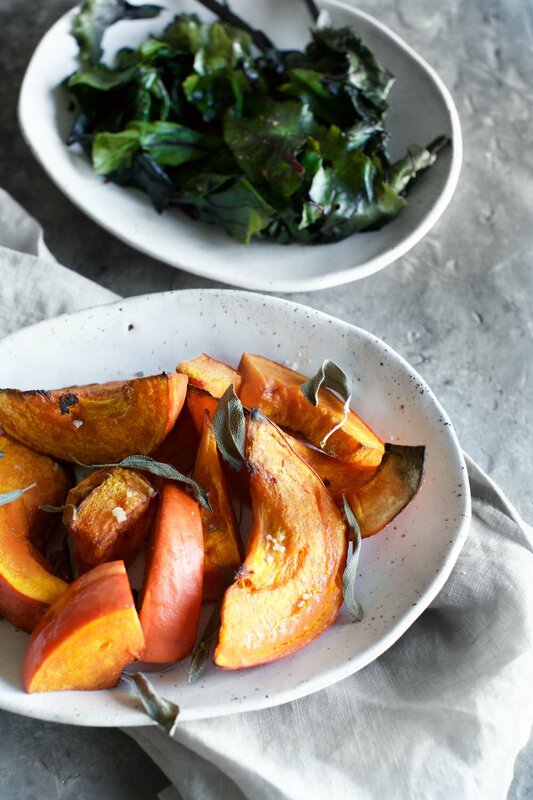 Chop and sprinkle the fresh sage on top of the kabocha squash at the 30 minute mark, roast for an addition 5 - 10 minutes. Check with a fork that the squash is tender before removing from the oven. If you have access to a plethora of squash like I do, try adding some types of roasted squash to your weekly meal prep. Lentil and Greens Spaghetti Squash Boats, Dumpling Squash Bowls, and Pumpkin and Great Northern Bean Hummus are all easy components to include in weekly meal prep as the weather gets colder.